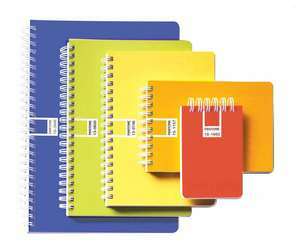 CARLSTADT, NJ -- (MARKET WIRE) -- September 6, 2005 -- Pantone, Inc., the global authority on color and provider of professional color standards for the design industries, today announced the availability of PANTONE UNIVERSE Stationery, a collection of stationery and office supplies. This extends the PANTONE UNIVERSE brand of colorful, design-driven consumer products. Produced in European sizes, the assortment includes notebooks (MSRP $2.25-$6), memo pads ($2.75-$3.50), business card holders ($6-$8), report pads ($4.25-$5), presentation book ($9), postcard holder ($9.75), file boxes ($6), and more. The colors include Tomato, Simply Taupe, Dazzling Blue, Sulphur Spring, Flame Orange, Daybreak and Maize. In addition, packets of paper and envelopes are available in Orchid Bloom, Sunny Lime, Pastel Blue and Mineral Gray ($2.50-$5). The colors are culled from the PANTONE® for fashion and home color system, the most widely used and recognized color standard in the world. Drawing upon decades of research into the psychology of color, Pantone provides three emotional cues for each color in the collection, allowing the consumer to better understand their individual color preferences. For example, Tomato (PANTONE 18-1660) indicates dramatic, impulsive and daring, while Sulphur Spring (PANTONE 13-0650) is energizing, lively and trendy. Taking its cues from the iconic PANTONE Color Chip and numbering system, each item bears the PANTONE UNIVERSE signature. "Hundreds of thousands of design professionals rely on Pantone for color standards and color trend direction," explained Lisa Herbert, Pantone's executive vice president of fashion, home and interiors. "With PANTONE UNIVERSE, we are able to extend Pantone's color and trend expertise beyond the professional into colorful, design-driven lifestyle items for the consumer. Our wide selection of stationery items offers a chic, fun and affordable way to brighten one's personal and business correspondence." PANTONE UNIVERSE Stationery is currently available at The Terence Conran Shop, The Museum of Modern Art Gift Shop, Felissimo, Sam Flax and A.I. Friedman, as well as www.pantoneuniverse.com. PANTONE UNIVERSE Stationery is produced under license by Sunstar and created in Japan, where it is sold at LOFT stores and other leading department and stationery stores. Other PANTONE UNIVERSE products include the limited-edition PANTONE Flight Stool, available at www.pantoneuniverse.com, and PANTONE Palette Plates, a collection of dishes available at Fishs Eddy and www.fishseddy.com. Pantone, Inc., developer of the globally accepted PANTONE Color Systems, is the leading source of traditional and electronic products for the selection and accurate communication of color. With over 40 years of experience, Pantone is recognized as the worldwide market leader in color communication and color technology for the graphic design, printing, publishing, fashion, home furnishings, interiors and industrial design industries. More information is available at www.pantone.com and www.pantoneuniverse.com. PANTONE® and other Pantone, Inc. trademarks are the property of Pantone, Inc. © Pantone, Inc., 2005. All rights reserved. About this company Pantone, Inc.
PANTONE UNIVERSE Stationery for home and<br>office is driven by emotional cues.